There are many reasons why an individual might experience symptoms such as arm pain, tingling or numbness in the upper extremities, or perhaps other symptoms such as neck pain or even arm weakness. If you are having any of these symptoms, it is important to seek out a professional medical diagnosis to determine precisely what is the cause. In some cases, patients will receive a diagnosis of thoracic outlet syndrome. In this post, we will outline what this disorder actually is, the symptoms a patient might experience and effective treatment methods for this syndrome. 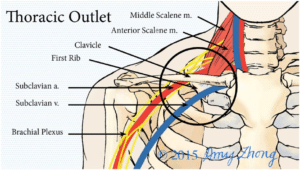 The thoracic outlet is the area located between each collarbone and an individual’s first rib on either side. Both nerves and blood vessels travel through this space eventually going down the arm, even down to the fingers. On the opposite side, lies the cervical region which houses many nerves and other components responsible for innervation of the arms and various other parts of the body. Sometimes compression can occur in the thoracic outlet area due to trauma such as a vehicle accident, a repetitive injury that occurs in certain types of occupations, or perhaps a sports-related activity. Having an extra rib can place additional compression on this area as well as poor posture, obesity, and some pregnancies if a woman’s ribs are pushed out of their normal space due to the increasing pressure of their baby. Females are more prone to TOS than males and it is more commonly found in younger adults between the ages of 20 and 40. There are a myriad of symptoms that might present in a TOS patient. It is important to obtain a proper diagnosis since many of the symptoms can mimic other medical issues such as carpal tunnel syndrome, tennis elbow, cervical issues and problems in the shoulder area. 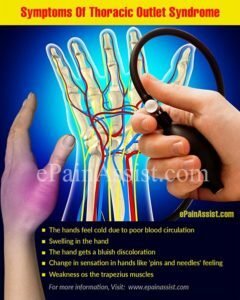 Overall, most symptoms are related to compression of the nerves running through the area, however since blood vessels also travel through the outlet, compression of the arteries that carry blood to the arms, hands, and fingers can lead to circulatory symptoms. If a patient has symptoms such as hand pain, arm weakness, neck pain or shoulder pain, thoracic outlet syndrome could be the cause. Other symptoms might include a weak pulse, cold fingers, a bluish discoloration of the hand, and numbness and/or tingling through the arm, even down to the fingers. Physicians will take a patient history, perform a physical exam, likely including some manual tests in an attempt to reproduce symptoms. They will often schedule further testing to confirm their diagnosis. These additional tests might include an X-ray, MRI, ultrasound, a CT scan and/ or nerve conduction test. Depending upon the cause of TOS, there are a number of treatment options available. Although surgery might be suggested for those who need an extra rib removed or for someone with severe symptoms, in most cases, physicians prefer to treat their patients with conservatives measures first. A physician might prescribe NSAIDs designed to reduce inflammation, as well as clot-dissolving medications in order to prevent blood clots from forming due to compression on blood vessels. A physician will often recommend a series of physical therapy sessions as well. A professional PT can instruct their patients on stretches designed to increase their range of motion throughout the neck, collarbone, shoulder and arm areas. If weakness has occurred anywhere in an extremity, a physical therapist will provide exercises designed to support and strengthen weakened muscles. They might also use treatments such as ultrasound and massage in order to reduce pain levels for their patients. To prevent further issues, physical therapists can also provide instruction on proper posture and how to avoid injury from repetitive motions. 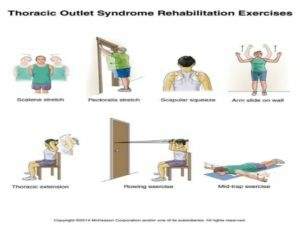 If you would like to know more about physical therapy treatments for thoracic outlet syndrome, please call us at 570-208-2787 or email us at: cawleyptfrank@gmail.com.